At a vestry meeting in 1735, the proposal was made to set up a borough workhouse in a house in St Mary's churchyard. This finally took place in 1738 when the gift to the town of £100 by John, Viscount Chetwynd, was used to convert the outbuildings of the former college house at the south of the churchyard. The establishment comprised six chambers, hall-place or work-room, kitchen, pantry, brewhouse, cellar store-room, washhouse, and garden. Some of the inmates were employed about the house or in nursing the sick. Others were employed outside and were allowed to keep half their wages. Children aged from five to nine worked at spinning or knitting but were also taught reading. The first Master was John Hill who was paid a salary of £15 a year for himself and his wife, plus 12 tons of coal from a local colliery. By 1774, paupers were being "farmed" by a workhouse contractor at a rate of 2s. a week each. A parliamentary report of 1777 recorded a local workhouse being operated by the parishe of Stafford—St Mary and St Chad which could accommodate up to 31 inmates. In 1806, by which time the workhouse held seventeen inmates farmed at 3s.3d. a week, conditions in the workhouse were dirty and unhealthy. However the building continued in use until the opening of the new union workhouse in 1838. The old building was then sold to Thomas Salt. County of Stafford: Bradley (2), Berkswick or Baswick, Brockton, Castle Church (2), Colwich (2), Fradsell, Gayton, Haughton, Hopton and Coton, Ingestre, Marston, Randton, Salt and Enson, Seighford (2), Stafford United Parishes of St Mary & St Chad (4), Stowe (2), Tixall, Whitegrave, Weston-on-Trent. The population falling within the Union at the 1831 census had been 17,382 — ranging from Ingestre (population 116) to St Mary & St Chad (6,956). The average annual poor-rate expenditure for the period 1834-36 had been £4,815 or 5s.6d. per head of the population. At the east side of the building stood the three-storey entrance block which would have contained the guardians' board room, porter's room, waiting room, clerk's office etc. A 1912 view of the workhouse shows it to have had an unusual degree of decoration with Venetian windows, stone dressings, clock tower etc. The stone for the dressings was donated by Lord Talbot, although the union had to pay the costs of quarrying it. 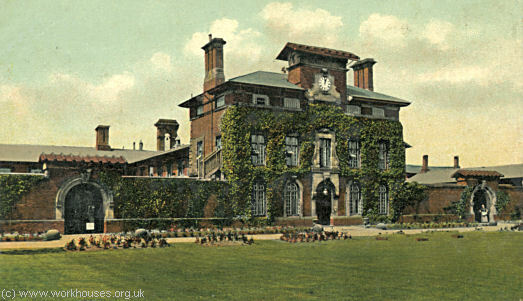 Stafford entrance block from the south-east, c.1912. To the rear lay a typical cruciform layout with male quarters to one side and female to the other and the master and matron's quarters at the centre above which hung the workhouse bell which governed the inmates' daily routine. The 1885 map shows a smallpox hospital situated at the north-west of the site. In the late nineteenth century, an infirmary was built running east-west at the south side of the main workhouse. A nurses' home was erected to its east and a mortuary to its west. A new lodge was also erected at the site entrance. After 1930, the workhouse became Stafford Public Assistance Institution. After the inauguration of the National Health Service in 1948, it was renamed Fernleigh and comprised an old people's home, together with a hospital for the chronic sick, maternity cases, and those suffering from skin diseases. In 1971, the old people's home was replaced by a new building called Foxwalls at the east of the site. The hospital closed in 1974 and was used for a period as health authority offices. Virtually all the former workhouse buildings have now been demolished. 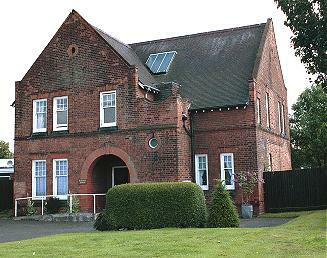 Stafford nurses' home from the north, 2000. 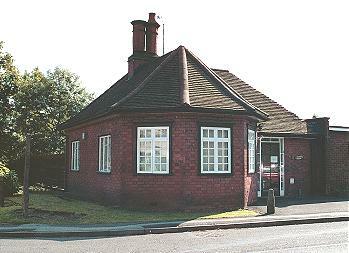 Stafford entrance lodge from the north-east, 2000. 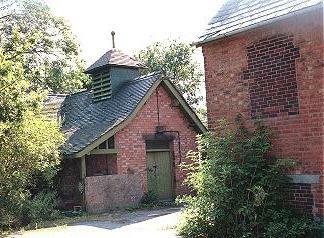 Stafford mortuary from the north-east, 2000. I lived in what used to be Stafford Union Workhouse up to 1973 when it was finally closed down, prior to being demolished. My parents were the Matron and then Superintendent of the home and hospital and oversaw the transition to the new home for the elderly — Foxwalls. I can still recall one of the residents who had been in the home all their life calling my father the "master" and my mother "master's missus". He had always been blind — which may have been why he was in the workhouse in the first place — and he used to feel my mothers cuffs on her matrons uniform to identify her. Staffordshire Record Office, Eastgate Street, Stafford, ST16 2LZ. Holdings include: Guardians' minute books (1836-1925); Admissions and discharges (1842-1930); Births (1914-30); Baptisms (1900-27); Deaths (1858-1930); etc. A History of Staffordshire Victoria Country Histories.